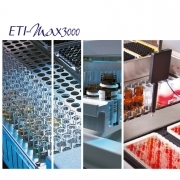 The ETI-MAX 3000is a fully automated microtiter plate analyzer performing the complete sample processing (sample pre-dilutions, sample and reagent dispensing, incubations, wash processes, plate transports) as well as the photometric measurement and evaluation. The instrument is controlled by Windows PC software. This software allows the user to process the pre-defined assays of DiaSorin as well as assays programmed by the user. The clear structure with intuitive user-guidance allows simple and quick operation of daily routine jobs as well as programming of user-specific assays. Full process control to guarantee safe results. Barcoded samples and reagents reduce operator’s errors. High dispensing precision with clot detection and no carry-over with disposable tips. Multiple analytes on the same plate (1 up to 12) or single analyte per plate. Multiple SW functions available during the run. Continuous loading of samples and reagents: increased number of results.